moved to www.skorchmag.com! : (MUFE) Foundation Review - The Official Blog of Lourdes G.
(MUFE) Foundation Review - The Official Blog of Lourdes G.
Although this foundation provides full coverage, the end result is completely adjustable to fit your needs - a little goes a long way. I have tried pretty much every foundation you can think of that claims to have oil-free/long-lasting/shine controlling qualities. If they don't break me out or melt off of my face, they usually don't provide enough coverage. As I've mentioned before, with my pale skin any blemish can scar and those scars are very tough to cover let alone get rid of. This line has a great color range and does what it says it will. The coverage never looks like a mask but it does a good job (the only true full coverage makeup is called Photoshop) and doesn't break me out. Despite the Florida heat and humidity, this foundation holds up well and also photographs well. If you wanted a sheerer coverage you can apply with a damp sponge but I like my skin even and smooth, so I go for full coverage. I know $34 is a lot for foundation, but if your skin doesn't look good, then it won't matter what the rest of your makeup looks like--you need that perfect canvas. I have learned not to skimp on two things: foundation and skincare. You can buy drugstore lip products and eyeshadows, but make sure your skin products are top notch! 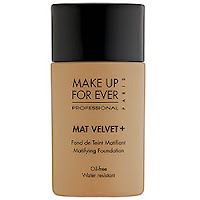 MUFE is a great line overall and many of their products are worth checking out--especially Mat Velvet +! CLICK HERE TO GO TO LOURDES'S BLOG NOW!